For those who are curious, I’m running a little below the target for total wordcount, but it’s been a good writing day: 1,710 words today. The project I’m working on isn’t a new one, but one I’ve been really gunning to finish, so whatever the wordcount ends up being by the end of the month, fingers crossed the story draft will be entirely wrapped. There is no way to be prepared adequately for the experience of raising a dragon. I can say this definitively, because I’ve read about raising dragons, and I’ve raised a dragon, and there is absolutely no way that one prepared me for the other, except possibly by encouraging me to think it could be done. But I’m getting far ahead of myself. At the point where my life took a precipitate turn into the ridiculous and simultaneously sublime, I was a twenty-year-old Ivy League student and a self-professed dragon geek. I had historical prints of medieval and Asian dragons in my dorm room. I read all the versions of other people’s dragons I could find—all the Yolens, McKinleys, McCaffreys, you name it. It wasn’t what you’d call an obsession—I did other stuff too—but it was more like an underlying principle in my life. An openness, if you will, to the idea that such marvelous creatures could exist, as more than just a collective unconscious memory of dinosaurs from our teeny ratlike mammalian ancestors. Like I said, a dragon geek. I made no apologies then, I certainly won’t now. Not after everything that’s happened. No matter what my unrepentance costs. So there I was, spending the summer after my junior year interning at a historical society in an unpronounceable town in Wales. Sure, I could have done something similar a hell of a lot closer to home. But can you name a single US state flag with a dragon on it? I loved Wales exactly as much as I thought I would. It was tiny, it was rocky, it was stuffed to the gills with music and legend, and it so far had better weather than the tour books had warned me to expect. I was learning to drive on the wrong side of the road in a ridiculously small blue car, making an unhurried study of the ales and ciders of the area, and climbing dilapidated castle towers in sheep pastures with my free moments. And on this particular day, just before it all changed, I had given up on castles for a trip to the uncompromisingly wild Welsh seaside. It was heavenly. I had a sweater, a sketchbook, a picnic, and a towel in my backpack, and a flashlight, because my host family had told me there were some safe shallow caves to explore at the foot of the cliff. You don’t go spelunking alone. I knew it as well as I knew all those other rules—no swimming alone, no hiking alone, unless someone knows your itinerary and how long you plan to be gone. So I should not have taken my hosts’ word for it that the caves were safe, having never been there myself. But I’ve already refused to apologize—and if the fact that I hauled myself into those caves with cheerful unconcern makes me look like the idiot that gets eaten by the monster in the opening scene, so be it. I make no excuses, but I will try to explain. The caves called to me. The whole country did—I’d been feeling surprisingly at home here all month—but now it was like having ants crawl all over my skin, but in a good way. Like being bathed in electricity but without the imminent threat of a shock. Laugh if you want, but my skin was humming when I got into that cave. I couldn’t have turned back if you’d dragged me. So I took my flashlight, shouldered my pack, and clambered through a cave that had many more intriguing nooks and crannies than promised, stacking pebbles when passages branched so that I would know if I were going in circles—and so I’d know my way out. When I smelled and felt the fresh air blowing on my face, I grinned. I’d found a way through to the next bay in the cliff! And if I noticed the slight shimmer to the air or the chiming noise as I broke through into the sunlight again, it was only subconsciously—I remember it now only because it haunts my dreams. I’d like to say that the clues were obvious, that I knew immediately what had happened—but other than a vague memory of that chiming in my head, I noticed nothing. Of course, the fact that she was lying there on the edge of where the forest met the beach sort of distracted me from everything else. 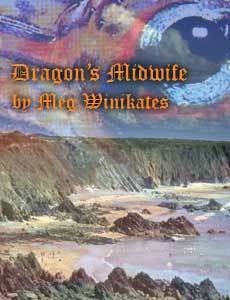 This entry was tagged dragon's midwife, nanowrimo, progress report. Bookmark the permalink.